In case anyone was wondering, I'm a big fan of coconut. I have recipes on my blog for coconut cake, coconut-topped chocolate cake, coconut macaroons, coconut custard pie, and coconut pecan pie. Picking which one is the best is difficult because they're all so good, but I am leaning toward this one. It's so creamy and delicious. 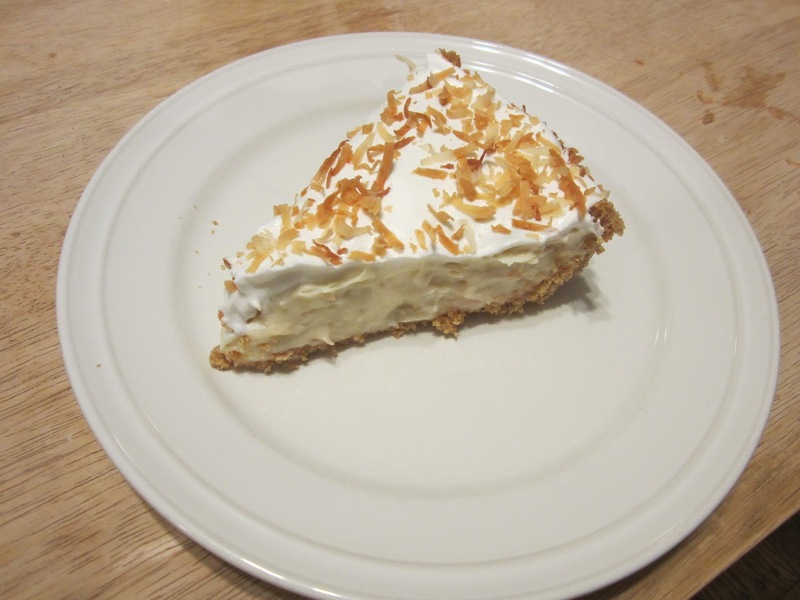 It's certainly the best coconut cream pie I ever had. Many of them are lots of fluff and not a lot of taste, but this one is richer and with a more substantial, homemade taste. Plus, it's not that hard to make. The most difficult part is waiting for it to cool and set up so I can eat it. 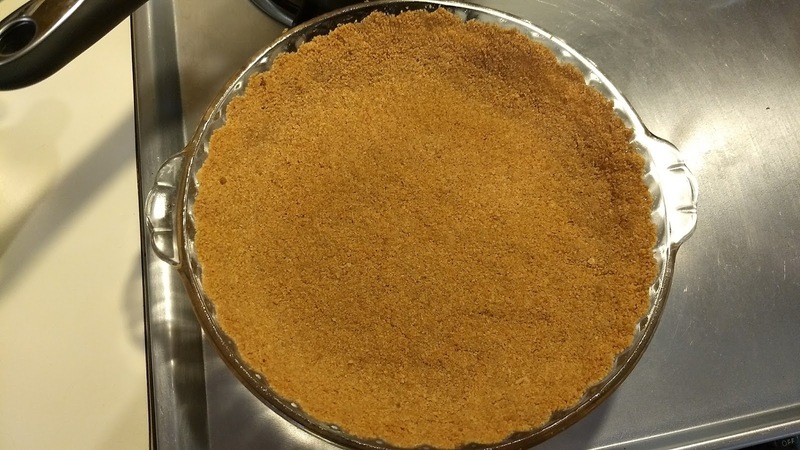 First, make the graham cracker crust. If you're in a hurry or cooking-impaired, you can use a store-bought crust, but it's easy and cheap to just make one. Chop the graham crackers into fine crumbs. I use a food chopper, but you could also place them in a plastic baggie and beat them with a wooden spoon. Stir in the melted butter and brown sugar until all the crumbs are moistened. Press the crumbs into a greased pie plate to form a crust. Bake the crust at 350 degrees for about 5 minutes. This helps melt the sugar and solidify the crust. Cool the crust. 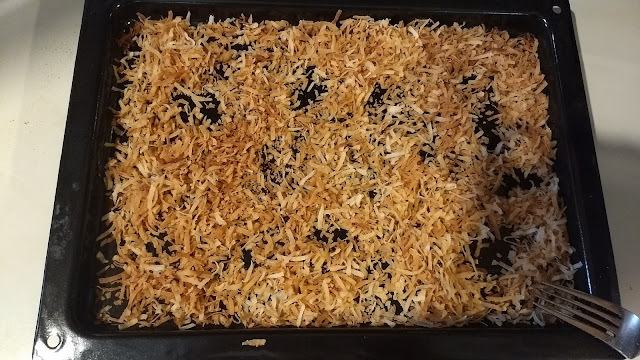 Toast the cup of coconut on a baking sheet at 350 for about 5-8 minutes, stirring occasionally so that it all gets evenly toasted. I do mine in the toaster oven where it's easier to keep an eye on it and doesn't heat up my whole kitchen. Beat the eggs in a 3-quart saucepan. Stir in the half-and-half, sugar, salt, and flour. 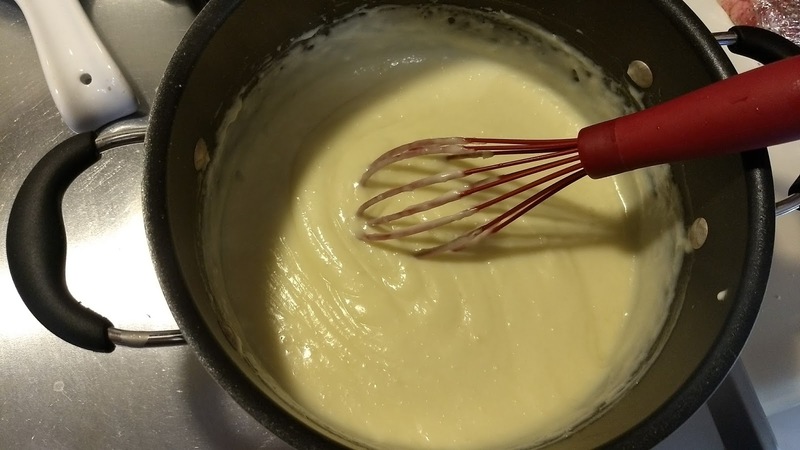 I usually don't keep half-and-half on hand, so I just mix 1-1/2 cups whipping cream with 1-1/2 cups milk to make my own half-and-half. Bring the mixture to a boil over medium heat, stirring constantly. It will thicken into a pudding. Remove the pan from the heat and stir in 1 tsp vanilla and 3/4 of the coconut. 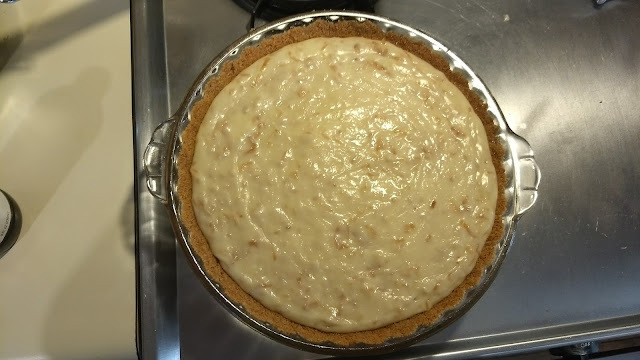 Pour into pie crust and smooth the top. Chill 4 hours or until set. 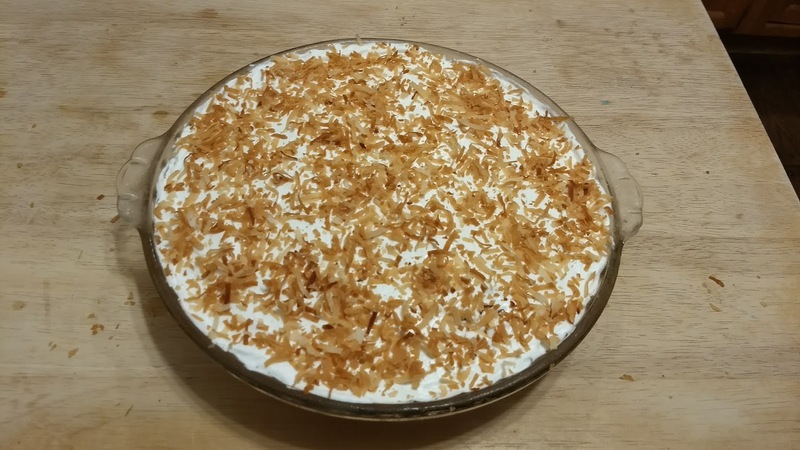 Spread with 1 cup cool whip (or a little more, if you want) and top with the remaining toasted coconut. Enjoy!